The A5 can be seen in the centre of the board. 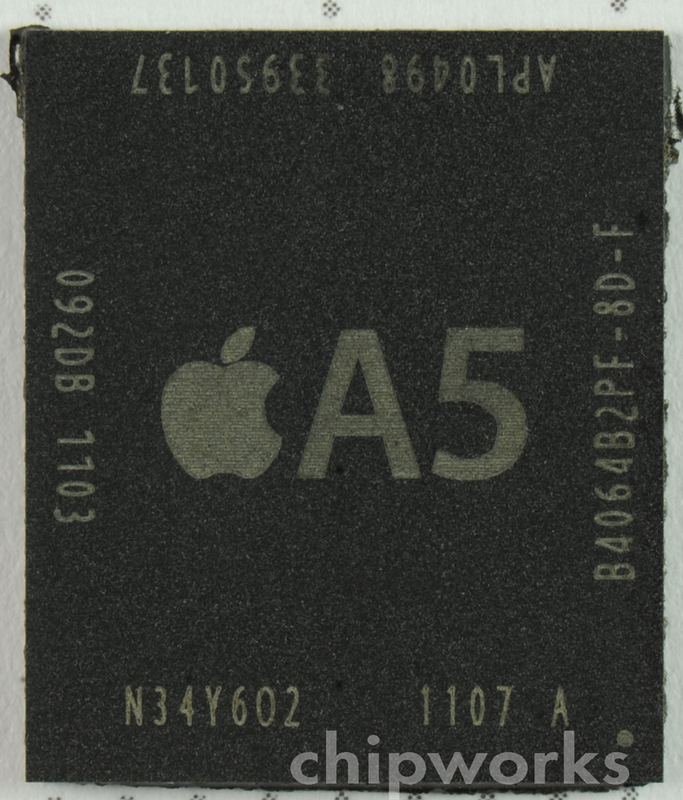 If we look at the package we can identify the Apple’s APL0498 marking for the A5 (the A4 is APL0398), and also 4 Gb of Elpida mobile DRAM. Date codes are 1107 for the A5 and 1103 for the memory – only a few weeks in the supply chain here! 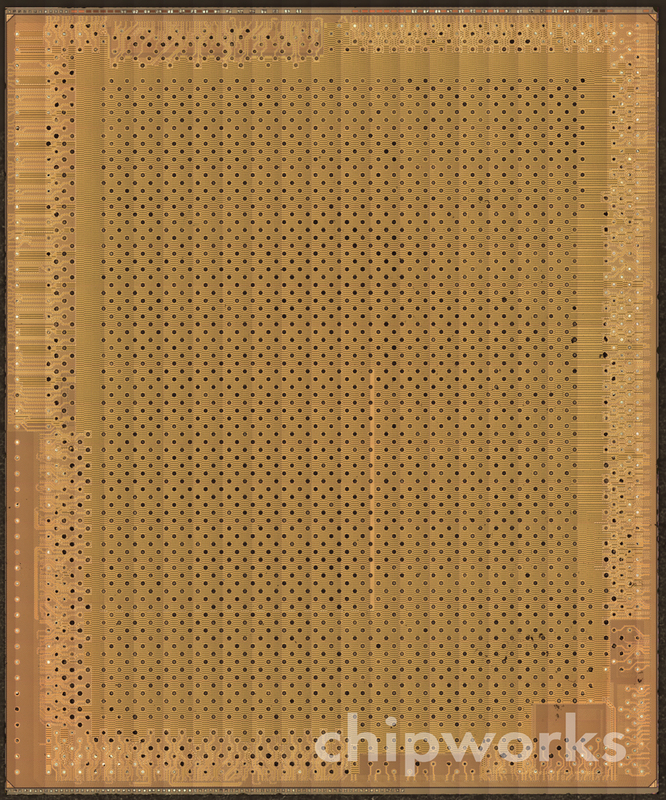 The x-ray images show us that we have the usual package-on-package (PoP) structure, with two memory chips in the top part of the PoP, and the APL0498 processor on the lower half. 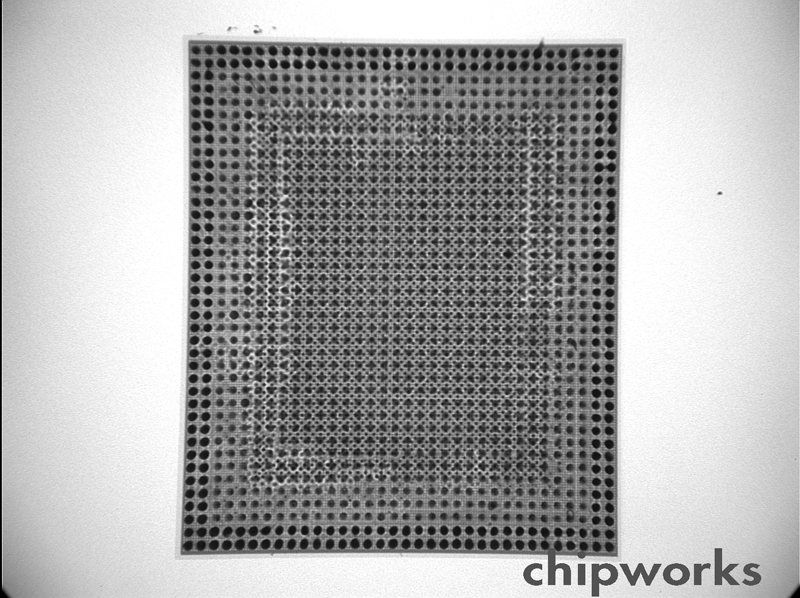 The two rows of dense black dots on the outside of the image are the solder balls from the memory chips in the top half of the package (connecting with the bottom half), and the less dense dots are the solder balls on the bottom half of the package connecting the A5 chip to the iPad board below. 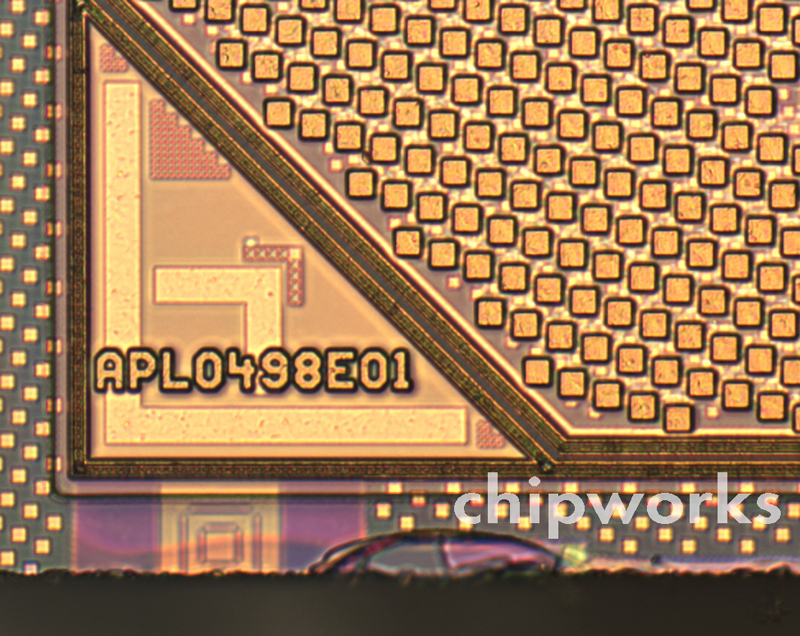 If you squint really hard you can see smaller dots about five rows in from the edge which are the flip-chip solder balls on the A5 die – and they take up quite a large proportion of the area, showing that this is a good-sized die. Given that the A5 is a dual-ARM core, and has more graphics capability than the A4, more than doubling the size is to be expected, but it’s also a clue that this is still made in 45-nm technology. 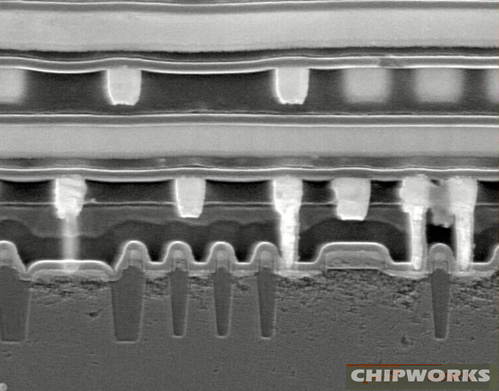 So after the web speculation that TSMC might be fabbing the A5 rather than Samsung, we had to take a look, and the quickest way is to do a cross-section and compare it with the A4 from last year’s iPad. 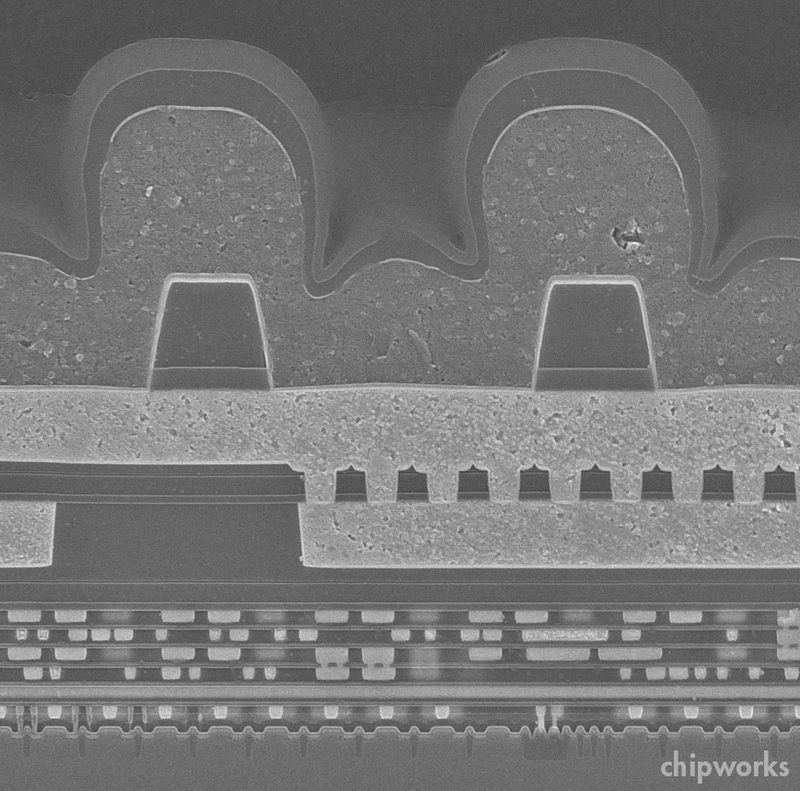 At this scale even electron microscopes start to run out of steam, so not the clearest of images in either case, but good enough to see the similar shape of the transistor gates and the dielectric layers. 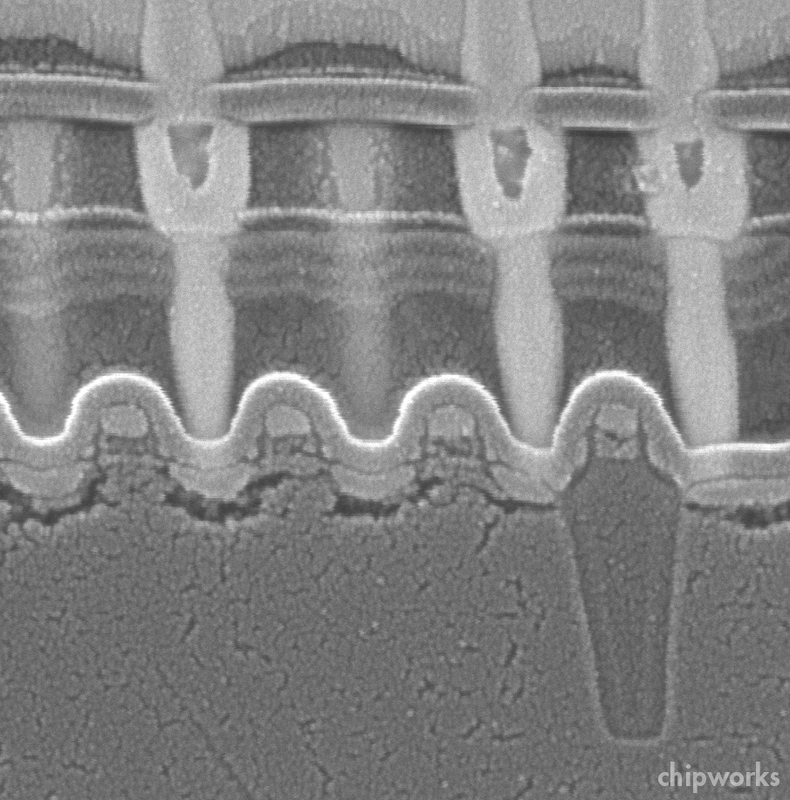 So at least this sample of the A5 is fabbed by Samsung, just as all Apple’s processor chips have been for the last while. 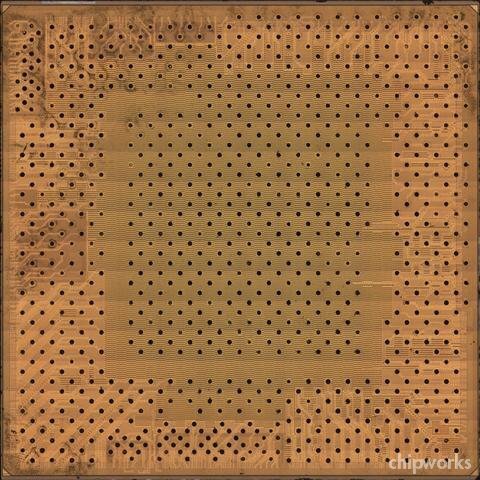 Many thanks to the guys in the lab who’ve worked through the weekend to get this information – Chipworks is not really in the media business, but there’s always a buzz when a hot new consumer part comes out. And on a different note, commiserations and condolences to our Japanese colleagues, they have much more important things of concern than the details of the iPad 2.